Walking and general movement, while simple processes which enable us move about have many sub-processes without which it would not be easy doing so. The foot, for example, follows a specific chain of events when you walk right from the landing of the foot, moving forward and other processes. Here, we focus on this process which is called foot pronation. Pronation is an important stage of the gait and stance cycles. After pronation, the next stage in stance phase is supination. Supination is the propulsive phase of the foot which enables you to move forward from the pronation phase. Pronation and supination, in simple words, are the landing and propulsion phases of your foot when walking and running. The feet carry all the weight of the body (and any extras) with considerable ease as you stand, walk, run or perform other activities. During the gait cycle, the foot will go through stages of pronation (flexible) and supination (rigid). If foot pronation is delayed into the latter stages of the stance, a problem will occur in your gait. For example, pronation will be abnormal when, instead of supination, the foot pronates. Overpronation instead of normal pronation will also change the gait of the individual. When you are standing still, the foot is neither pronating or supinating. This neutral position will change the moment you get into a stance and start moving. You will have a biomechanical problem if, instead of being in a neutral position, the foot is either supinating or pronating when you are standing still. Three main types of foot pronation are known namely neutral pronation, overpronation, and underpronation. 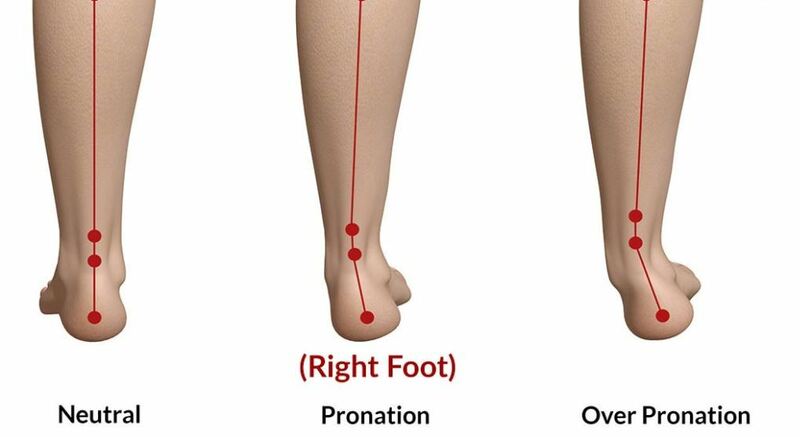 When the foot is experiencing a normal amount of pronation (rather than underpronation or overpronation), it is in a state of neutral pronation. In this state, the toe area is used when pushing the body off the ground than the other parts of the foot. Otherwise, the movement will be unbalanced and thus unhealthy. When the pronation is normal, the weight of the body is distributed among the toes with the big toe and the second toe slightly taking on more weight than the others. The adaptation of the foot to this work makes it possible to distribute the weight without any strain on the feet or the rest of the body. A problem occurs when, during pronation, more of the weight than is naturally required will be carried by the big toe and the second toe. This poor distribution of weight in the foot makes it difficult for the ankle to provide stability for the body. This poor weight distribution in the foot forms an unnatural angle between your foot and the ankle. The splaying out of the foot will thus be unnatural. While the presence of an angle between the foot and the ankle is normal, having it to the extent found in those who overpronate is not normal. Poor distribution of can negatively change the gait of the individual. The shoes you use will likely have different maximal joint eversion movement degrees. You can have walking or running shoes all with different maximal joint eversion movement degrees. This will lead to different gait and other issues. It is thus advisable to know exactly what shoes to use for what occasion to avoid creating issues with your gait. What are the effects of overpronation? The secondary effects of overpronation include having an increased rotation of the tibia. This often results in problems in the knee or the lower leg. The chances of having overuse injuries go up considerably with overpronation. These include knee pain, shin splints, the medial tibial stress syndrome and many others. Running without any shoes is the best method of preventing overpronation. The extra cushioning at the heels of running shoes increase pronation by requiring you to heel-strike with every step on your run. Studies have pointed out that you have the least amount of pronation when you run barefoot. Running without shoes has its risks the most obvious of which is having the soles of your feet punctured by sharp objects. For that reason, shoe designers have come up minimalist shoes which only provide protection against the ground but allow your foot to land and behave naturally. Taping the foot and leg in a specific way prevents pronation successfully. Foot taping methods such as the LowDye taping technique have been in use for a while with great results. Once you know of the method and its techniques, this is one of the cheapest ways of preventing overpronation. With every extra mile covered by a runner, the changes of having an injury go up mainly due to the increase in foot pronation. To remedy this issue, motion control shoes have been designed around the movements of the foot when running. These shoes work by limiting any excessive foot motions through the reduction of the level of plantar force generated through excess pronation. Shoes designed to offer stability and motion control possess a higher level of medial support than common shoes. In this way, they lower the amount of pronation by increasing the stability of the leg and the foot. With all types of shoes, the lacing pattern also plays a role in the amount of pronation possible. For the best results, use as many eyelets in the shoe, and tie it as tight as comfortably possible. Shoes can also be used to correct underpronation through extra cushioning. The use of foot orthoses has become popular given its approach to the functioning of the foot. After deep studies in the way the foot functions, foot orthoses have been designed to work with the pronation and supination processes while eliminating any issues that may jeopardize the two processes. Given that the axis of the rotation of the foot joints is never at a right angle to the cardinal planes (frontal, horizontal and sagittal), the blocking of any triplanar motion in one cardinal plane also prevents movement in the other planes. Working with this principle, experts have come up with designs for orthotic wedging and posting. Using these principles, supportive orthotics in shoes have been used in the treatment of injuries runners have owing to overpronation. Unlike other treatment methods for the same type of injuries, supportive orthotics will allow the runner to continue with their sport. It also has the advantage of allowing the runner to skip undergoing other treatment methods that may take up more time and require more resources. The success rate of orthotics in treating injuries related to running is at an impressive 75 percent. This is a clear sign of its effectiveness. Away from sports, orthotics is also used successfully in treating any biomechanical problems such as overpronation and others. Also called supination, underpronation occurs when there is not enough of the inward roll when the foot hits the ground. The result is that the weight of the body is spread to the smaller toes which are not naturally suited to such levels of weight. Underpronation, which is quite rare, can be easily solved with specific shoes which have been meant to correct this kind of misalignment. Whether you have overpronation or underpronation, you will need the attention of a doctor to decide the best method available for correcting the issue. Without correcting the issue, you are bound to have an unnatural gait and be prone to injuries.